Seeing a new pattern on all different shapes and sizes is the most important part of a pattern release, and something I really look forward to sharing every time. I have had a great time showing you all my three versions of Magnuson, but today I get to share the amazing versions my testers sewed up. 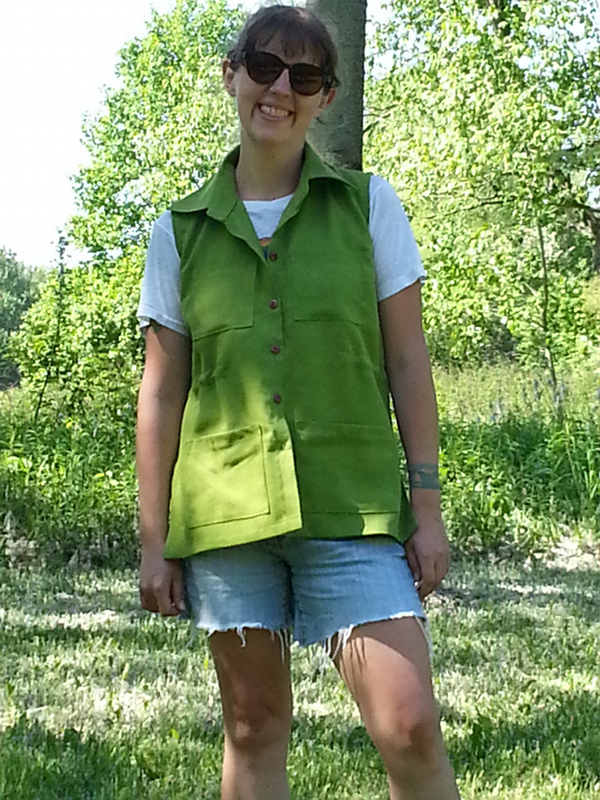 Kristin went very classic in the colour fabric she chose for her vest. I love how she styled it differently with the bold black and white striped tee and leggings. 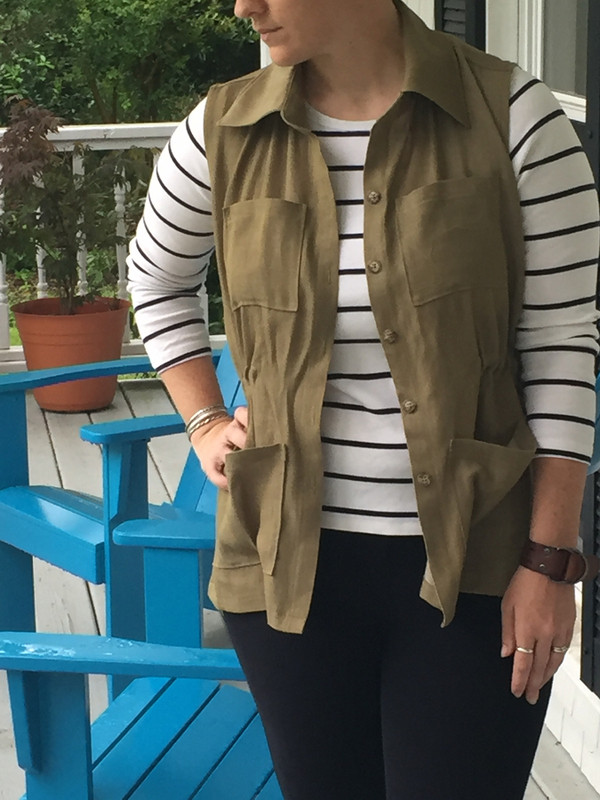 Kipp isn’t scared of colour with her choice of fabric for this vest. It inspires me to get out of my basics and make a more exciting version to add a pop of colour to my wardrobe. Alexis sewed up her version in a great camel coloured bottom weight which is going to get so much wear in her wardrobe. I especially like it paired with this rich purple dress. 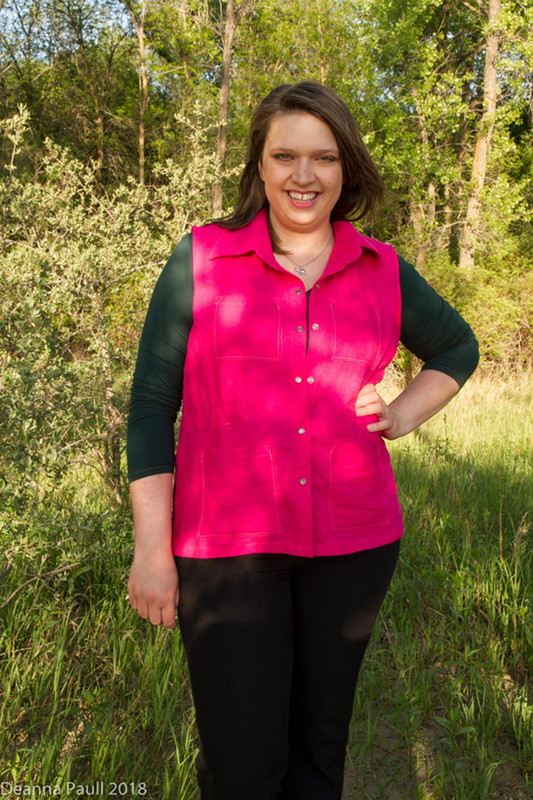 Alexis adjusted her vest for a perfect fit. 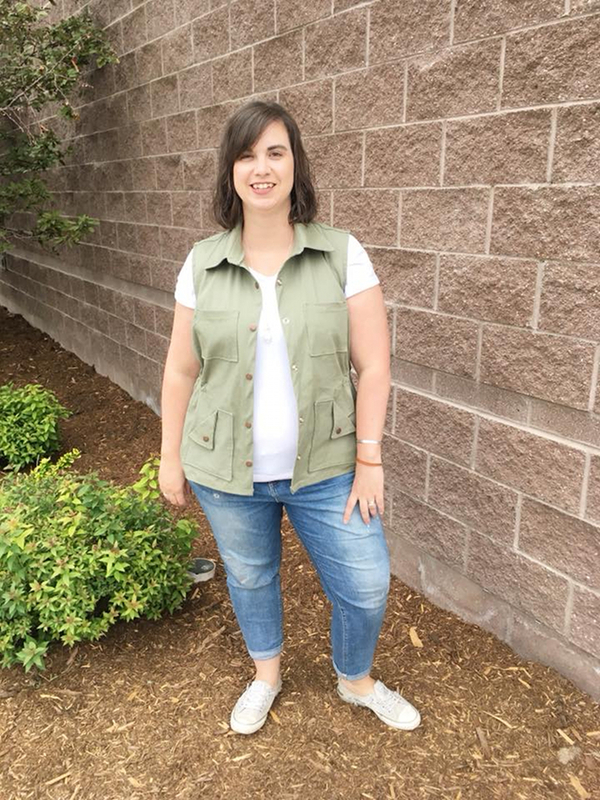 Katie joined the army green train and decided to switch things up by putting her waistband casing on the outside of the vest. 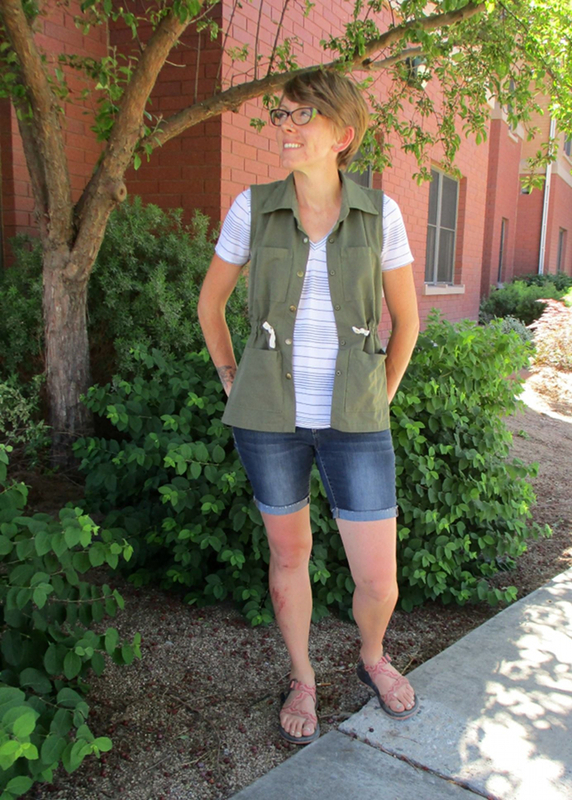 I love the casual vibe it gives the vest especially when paired with a t-shirt and jean shorts. 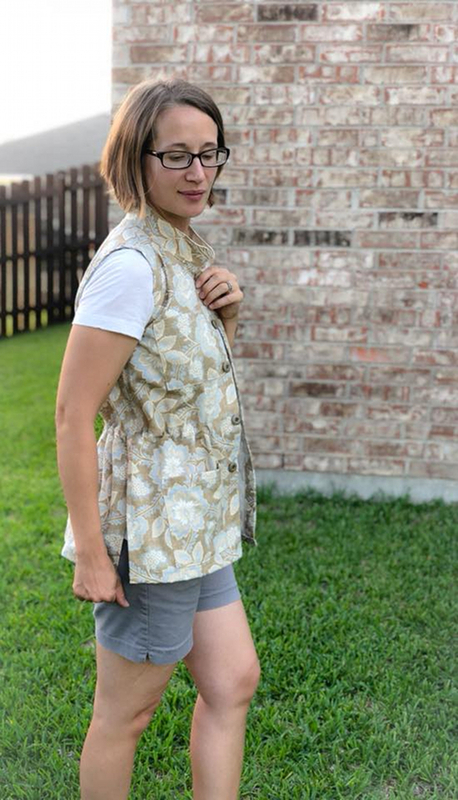 Jennifer went a fun print with her vest and decided to leave the collar off and just finish the top of the vest with the collar stand. 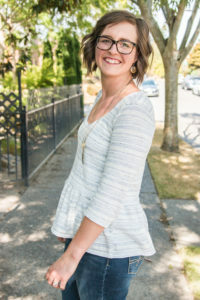 Such a fun look and sure to be the perfect piece to liven up her wardrobe. Maridalia chose a bold colour and just adore it paired with a fun print knit dress. 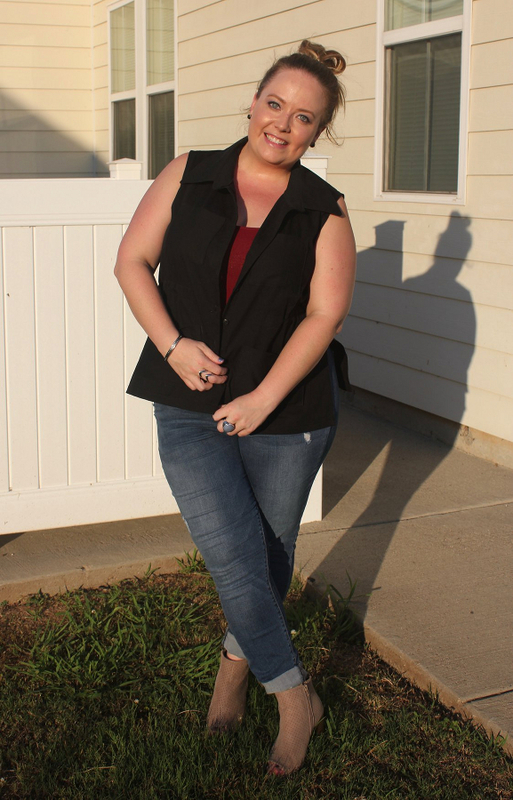 I love that she can dress this vest up with some strappy sandals and a dress or make it casual with jeans. So many options with a red vest. As soon as I saw Sharon’s I was so darn excited because it was pretty much the exact look I was envisioning when I designed the pattern. 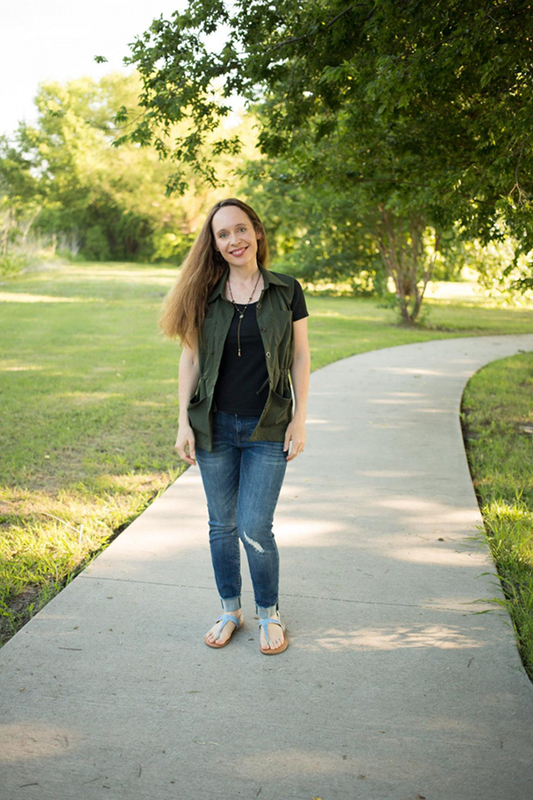 I love the ability that this can be casual or dressy and the perfect layer for running around town in. 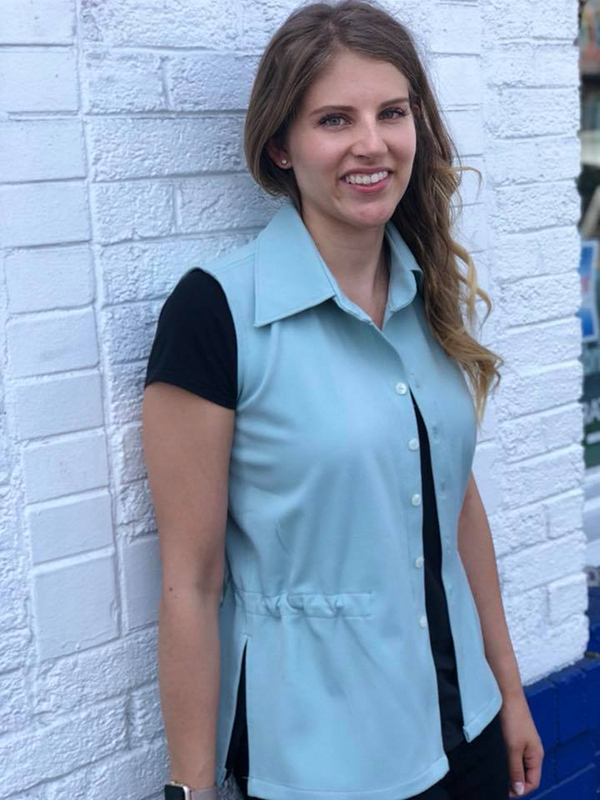 Stephanie went classic with a grey vest and I love how the topstitching on the vest stands out in this fabric. Grey is such a versatile colour that I am sure she will get loads of use out of this vest. 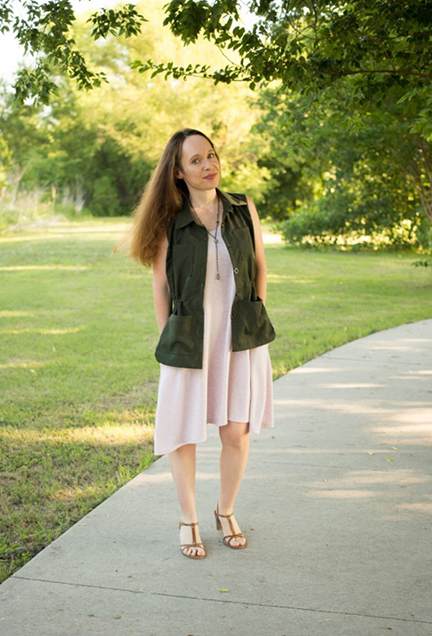 Robynne defined wearable muslin with this vest. What was intended to just be a muslin with some clearance fabric turned into the perfect pop of colour to add to her wardrobe. I love when you can finish a muslin and actually find a place in your wardrobe for it. Leslie made me a bit jealous with the choice of black for her vest, I didn’t realize I needed a black one until I saw hers. 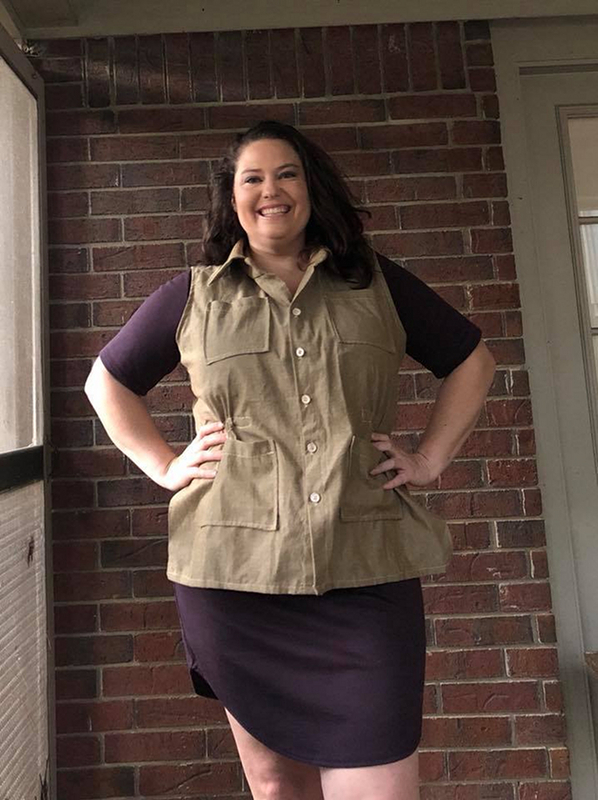 Leslie spent quite a bit of time making the adjustments for her body to the vest so that she could get this amazing fit. I appreciated the attention to detail she paid because it really helps me figure out what needs to change in the pattern or what will just need to be individual adjustments. Cathy decided to have a little fun with the pockets and it actually inspired me to share some pocket hacks with all of you next week. I love that she took the pattern as a base and played with it to make it her own. 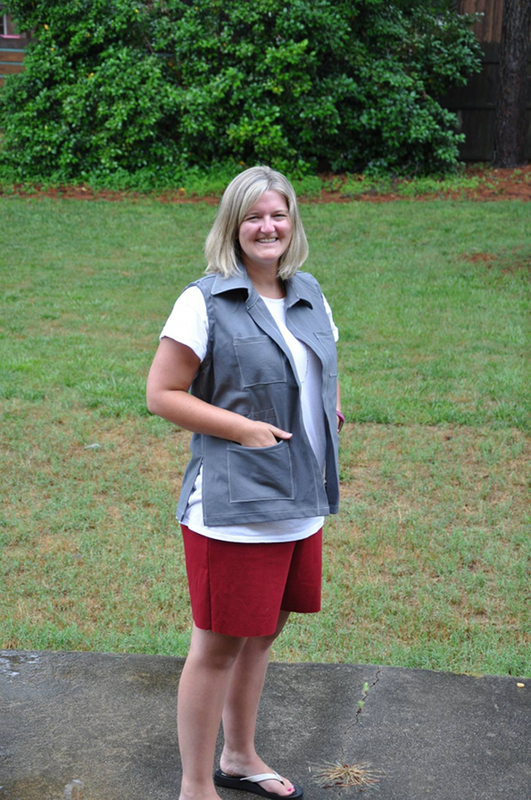 Andie opted to leave the pockets off her vest and I love the clean and simple lines. Andie also took her vest on a little field trip to the LA fashion district to take pictures, which is just so fun. 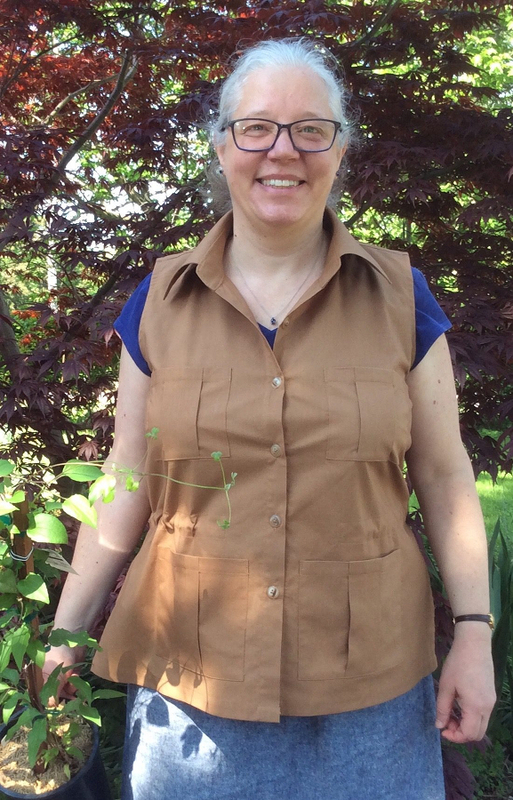 Anne also had fun with the pockets on her vest giving her a very utility vest look especially in the camel colour. 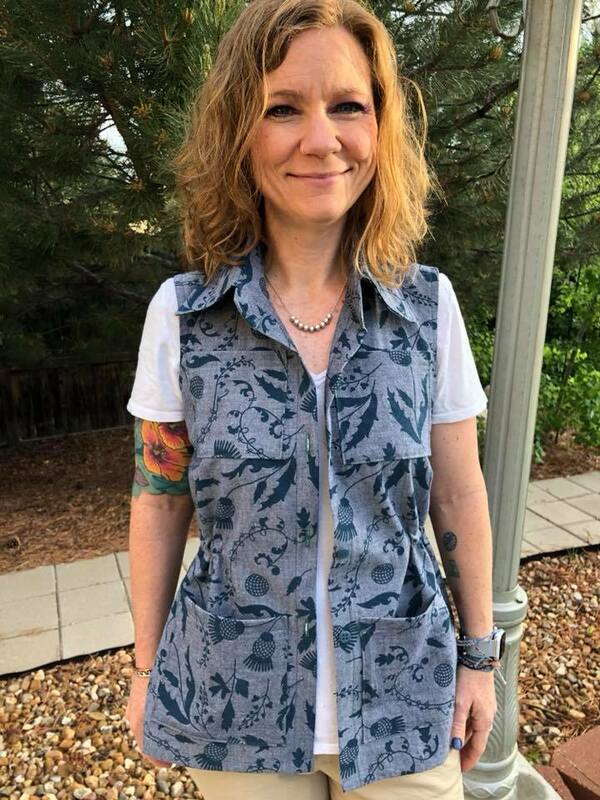 I love that Anne is planning to use this as a gardening vest, which is perfect with all of those pockets. Susi choose a neutral colour fabric and really let the pattern show off. 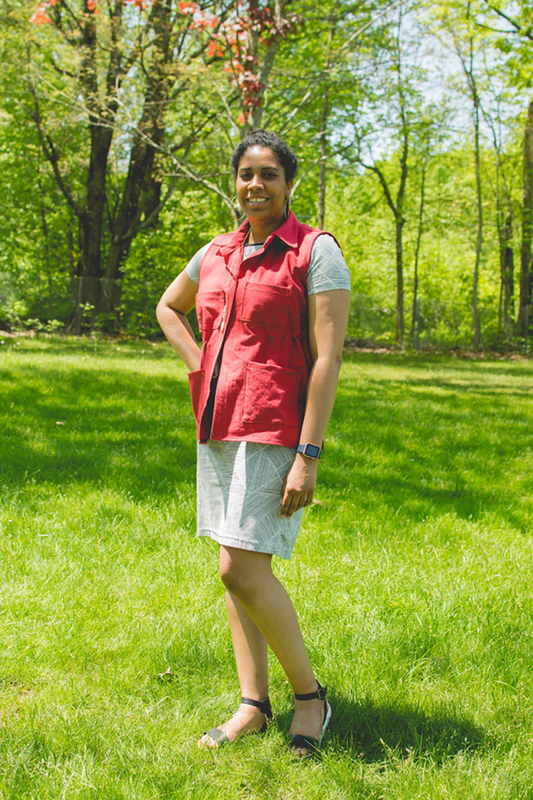 Instead of buttons Susi used snaps which works just as well and gives such a different look to the vest. Amy went bold with her fabric print and I just think everything about it works together. The crispness of the fabric paired with the print leaves you with a great piece that can be dressed up or down. I hope all of these lovely ladies have given you some inspiration on how you plan to sew your Magnuson vest. Remember that the pattern is on sale for $2 off through Sunday. There is a sew along in the works so don’t be worried if the flat felled seams or collar make you nervous, I will walk you through the whole thing.